Editor's note: Kasia Malinowska-Sempruch is director of the Open Society Global Drug Policy Program. The views expressed are her own. The drug trade is, in a word, enormous – of total global crime proceeds, the United Nations has estimated that some $350 billion comes from the sale of illicit drugs. But the economic costs are only one measure of the ineffectiveness of drug policies. When the human costs of violence, human rights abuses, infectious diseases and mass incarceration are considered, the damage to countries and communities is massive. How bad is it? The London School of Economics this week publishes a report that attempts to quantify some of these consequences of the war on drugs. The report has been endorsed by five Nobel Prize-winning economists who write, "It is time to end the 'war on drugs' and massively redirect resources towards effective evidence-based policies underpinned by rigorous economic analysis. The pursuit of a militarized and enforcement-led global 'war on drugs' strategy has produced enormous negative outcomes and collateral damage." Indeed, around the world, prisons are full of minor drug offenders, robbing households of primary wage earners and caretakers as well as devastating vulnerable communities, and the report specifically tracks how the introduction of harsh drug laws has contributed to the surging American prison population. Consider that in 1980, only six percent of people in state prisons in the United States were incarcerated for drugs. By 2009 that figure stood at 18 percent. The numbers on federal prisons are even more damning. In 1980, 25 percent of prisoners were incarcerated for drugs. In 2010 it was 51 percent of the federal prison population. Keeping prisons full of non-violent (and often low level) drug offenders is a drain on public coffers, sucking away resources that should be spent on treatment and prevention rather than a criminal justice system that offers very little to those in its care. Moreover, the stigma of criminalization comes with a bevy of additional costs, driving people away from services, inhibits participation in legal economies and exposes them to greater risks. Needle and syringe exchange programs are some of the most cost-effective preventive technologies available. After all, the treatment of blood-borne viruses such as HIV can be extremely expensive, while prevention is relatively cheap. A large Australian study, for example, found that for every dollar invested in these services, four are returned in healthcare cost-savings over the next 10 years. When patient/client costs and productivity gains and losses are considered, that figure increased to a return of $27 for every dollar spent. While similar benefits are associated with opioid maintenance therapies, in the five counties with the highest burden of HIV among injecting drug users only about two percent have access to methadone. Supervised consumption facilities, where people are provided with spaces to use drugs under the supervision of the medical professional with onsite social services are an exception, rather than a rule. Unfortunately, while recognized as public health best practices, these services are woefully underfunded and often come with very little political support. And there is perhaps no greater poster case for the failure of international drug control strategies than the violence that has plagued so-called "producer" and "transit" states in Latin America. Enforcement efforts, while having some successes, have generally just pushed the illicit drug trade, and related violence, across borders. 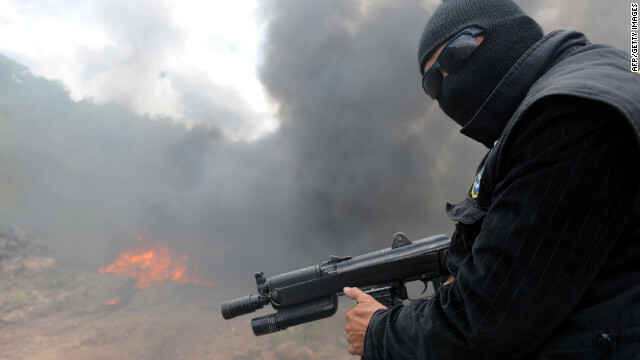 We've seen the drug trade move from Colombia to Mexico through various parts of Central America with no evidence that the overall supply of drugs have been affected at all. The vast imbalance with how drug laws are enforced tests the credibility of the entire regime. The world's banks are flooded with drug money and they get off by paying hefty penalties (last year, for example, HSBC Holdings agreed to pay nearly $2 billion) while the rural poor languish in prisons or are thrown off land that feeds their families for growing small amounts of coca or opium. As countries experiencing surges in drug activity see murder rates rise, corruption increase and social fabric of societies ripped to shreds, how much longer is it acceptable to ask them to be part of a failed strategy? In addition, a greater question now is what can be done? The LSE report urges the United Nations to drop its "repressive, 'one-size-fits-all' approach" and to "take the lead in advocating a new cooperative international framework based on the fundamental acceptance that different policies will work for different countries and regions." There's a reason why these calls are being directed at the United Nations. In 2016, at the request of several Latin American presidents, the U.N. General Assembly will hold a special session to review the functioning of the drug control system. The London School of Economics report is being delivered to a representative of the Guatemalan government – Guatemalan President Otto Pérez Molina inspired the 2016 session and has said he will use it in negotiations with other governments. The international discussions around drugs are sure to be tense. There is a powerful coalition that stands in defense of harsh drug laws, including Russia, Japan, Pakistan, China and Egypt. There are others in Europe that fully support a greater emphasis on health-based approaches, but are reluctant to tinker with international norms. Against this backdrop, the role of the United States is still undetermined, not least because it has traditionally been a barrier to progressive reforms internationally. Yet even in the U.S., new marijuana policies in Washington and Colorado, as well as recent federal efforts to address mass incarceration, signal there may be some evolution in American attitudes. The reason we have the drug policy we do is because it serves the status quo's interests. Drugs that cost pennies a dose to make sell for more than gold, on the street. It is estimated that somewhere between 500bn and 1.5 trillion dollars in illicit drug proceeds worm their way into the coffers of the international banking cartels annually. Wall ST is in love with its illicit cash, Frankly they dont care about addiction nearly as much as their illicit cash. Every major bank has faced drug money laundering charges, yet not a single banker has gone to prison, the bank simple pays what amounts to a small fee and business continues as usual. The entire thing is morally indefensible but what better consumers are there than drug addicts? They spend every penny they, get , for the most part. Yes, so We The People need to vote to legalize drugs which will take the profits out of the hands of the cartels and the Banksters and put it into the hands of American small entrepeneurs. Two thirds of the GOP is incapable of thinking. They would rather spend $1.5 trillion on the drug war over fear that marijuana is a gateway drug than spend a few $billion to save 300 million Americans from an EMP pulse caused by war or the Sun. As long as the big government RINOs continue to control half of Congress, we will be subject to unwavering lunacy. And the link with prison abolitionism? You can look at this from an economic perspective of being taxable or a human rights perspective in the violence in Mexico. From either angle, the obvious outcome is taxation and regulation. The repeal of alcohol prohibition is history, and history repeats itself. The only subtle difference is this time, instead of alcohol, we are legalizing cannabis. The crazy part being there are many medical uses for marijuana, zero for alcohol. Are you suggesting that we take all the fun the police and DEA have playing cops and robbers? How cruel. If they can't play their stupid games the prisons would only be 20% full and they would have to go back to their video games. And what will the bad guys have to do if we legalize All drugs? They won't have a reason to murder so many people in Mexico over the drug trade. Put all that money towards prevention and help. I think Ron Paul already said this....yep...I'm sure he did! Of course now that someone else in the Liberal media is saying it, people might actually listen! I see a lot of things that Ron Paul people are now saying, that only a few short years ago, Ron Paul was made fun of for saying! Sad how people let the media make their opinion's for them when it came to Ron Paul. He would have been such a great president! Paul was right about the endless Drug War which was started by Republican Richard Nixon. Nixon gave a speech in June 1971 and coined the term "Drug War" . He used it to arrest the anti-war protesters. So in many ways it is fitting that Ron Paul wanted to end the Drug War and other wars that have been pushed by Republicans. Unfortunately the Democrats have become reluctant to oppose wars since Vietnam because of the successful propaganda about "losing" the Vietnam war. President Obama was heavily criticized for not getting into the Syria War. He will be pressured to get into the Iraq civil war by many Republicans. So where is Ron Paul's son opposition to getting back into the Iraq war? Putting people in prison ruins their lives worse than the drugs do in most cases. Marijuana is not a drug. It is a leaf. If the last 3 Presidents had gone to jail for their drug use. . . well maybe we would have been better off. The pot head that screwed this country over was the major dummy, George W. bush. I thought Bushie was a coke head, no? War on drugs is a failure...legalize all drugs....end the violence...you don't see violence around cigarettes...but I bet if they were banned....I bet there would be. I believe Ann Coulter is a sign of moral decay! Prohibition of any substance as a means of crime prevention is immediately at a loss because it effectively creates crime. It is pretty well accepted that regulation provides many more levers than prohibition for effectively controlling use and decreasing consumption. We need to implement a limited legal drug market accompanied by grudging tolerance. By grudging tolerance I mean to include the same limiting measures applied to tobacco and alcohol including: taxation, strict regulation of cultivation/manufacture and sale, health warnings, consumer quality controls and age restrictions on sale. No policy is ever going to be perfect. But the introduction of drug taxation and regulation will surely be less costly to the community and less harmful to cannabis consumers than leaving the market to criminals and corrupt police. We love to blame every country but ourselves. Wake Up! The USA is also destroying its own tax revenue by placing such a high percentage of people in jail. It not only costs money to house the prisoners, but they are not collecting any tax revenue from them. Whatever happened to all the capitalist clowns?